Love this photo!!! I like the line of climbers and the feeling that they are striving to get to the top of Denali. The red of the climber in the foreground is nice. Also, this photo shows the beauty of Denali. The story behind "Row of climbers going for Denali’s summit, Alaska"
A row of climbers heading out from ’17k camp’, the highest camp on the normal route on Denali, the highest mountain of North America. Here they are at 17,000ft (5200m), the summit is another 3300ft/1000m higher, making for a tough and long day. It is really a wonderful place and as you can see, even in high season, it is not too crowded. Even though about 1500 people try to climb it every year between May and July, the mountain is so big that you are seldom bothered by crowds. 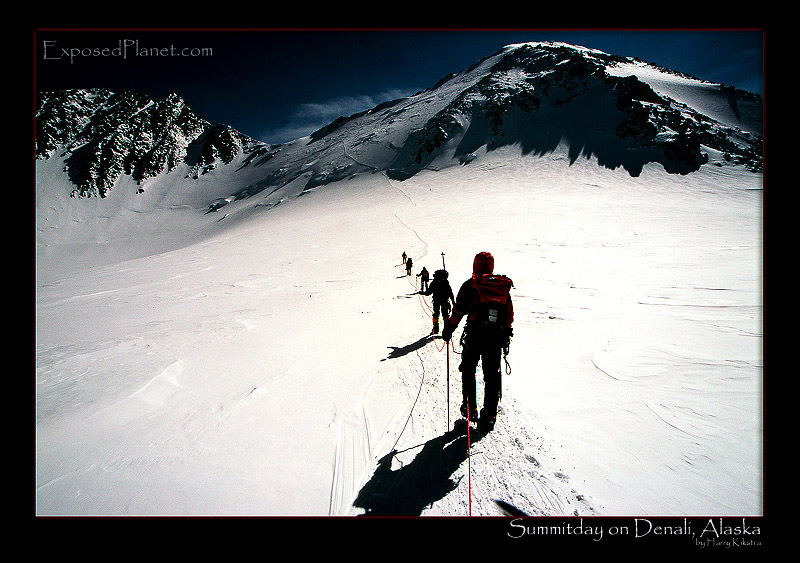 On average about 50-55% of those attempting Denali actually summit. A row of climbers heading out from '17k camp', the highest camp on the normal route on Denali, the highest mountain of North America. Here they are at 17,000ft (5200m), the summit is another 3300ft/1000m higher, making for a tough and long day.It is really a wonderful place and as you can see, even in high season, it is not too crowded.